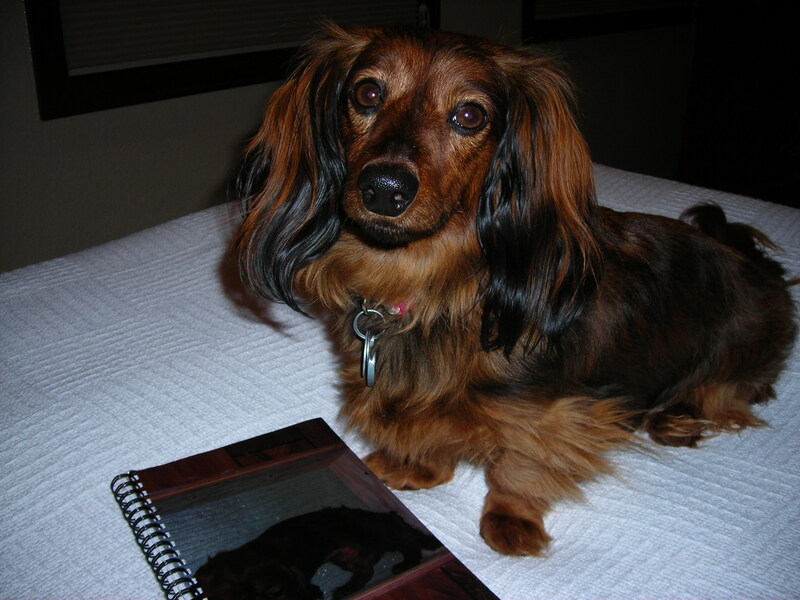 Zoey the Cute Dachshund is her BFF Shelley Widhalm’s co-pilot when she does her writing. Every time I visit my mother at her assisted living facility, I walk down the halls, feeling wonder at the corkboards filled with cutout magazine pages. One of the residents, Deloros, considers it her job to fill the white walls with images of wildlife, birds, historic ruins and travel—and sometimes people at work. She cuts out the images, tapes them to construction paper and highlights the text, turning routine magazine articles into art, education and entertainment. 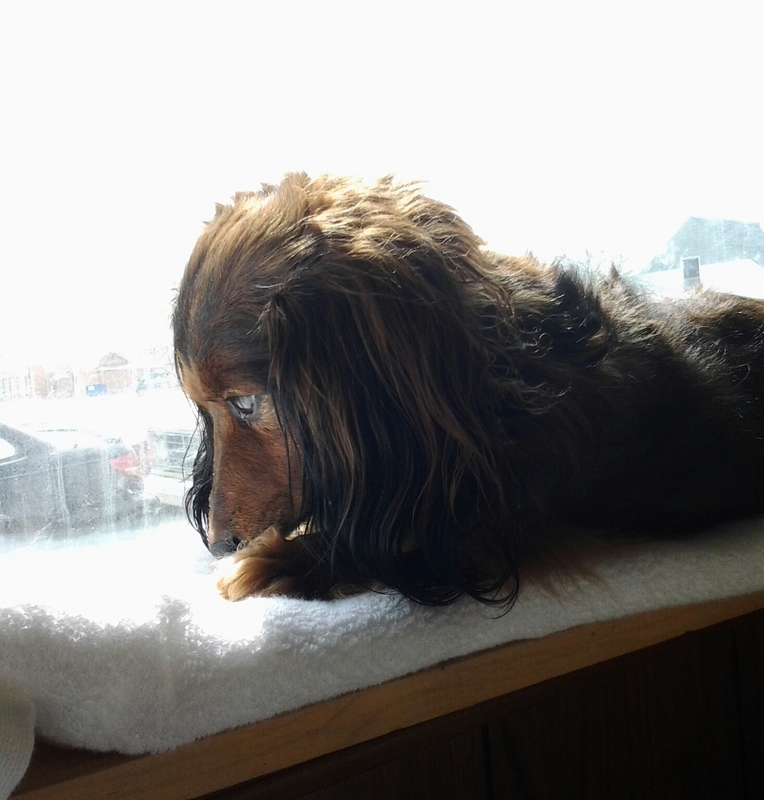 Deloros says she needs to finish her work before lunch as I stop to talk and let her pet my dog, Zoey, a long-haired miniature dachshund. I commiserate, because I know I would want the same thing in my retirement years—some sense of work and purpose. She tells me it helps her get up and going with her day. “Some feel lost until they have work,” is a line from a poem that perfectly fits our weekly encounters. The poem is about life at an assisted living facility and one of 15 that poets read Sept. 23 at the seasonal poetry reading hosted by the Community Poets in Loveland, Colo. The poetry reading, “Good Work!—A Post-Labor Day Celebration,” featured an open mike and the reading of poems focused on the autumnal equinox, work and going back to school. The poems were on subjects as varied as working in a mailroom, doing a long list of random jobs, going to a job interview, questioning choosing college over steady work, disliking repetitive factory tasks and seeing the act of pushing a pencil across the page as heavy work. My poems were about doing dishes and taking the trash to the trash room. “It’s easy to get lost in your career,” was a line from one of the poems, and I related. I find that working too much pushes out real life and fun if the hours become too many—and then I realize I need to work less to be a little more balanced. I wonder what I will do when I retire and how I’ll fill my days. Will I think I have to work, just like Deloros does? Will I be writing my novels and journaling because I believe it’s incredibly important? Will I be published and have “my work” continue bringing in money? Or will the work be something that gets me up to be doing something, anything, just as long as I keep busy? One of the poems was about Bud, whose job is listening to stories—and it turns out Bud is a dog. Zoey’s jobs involve going on walks, doing tricks and offering comfort to her human companions and those she passes by, like Deloros. She stops to visit Deloros and listens to her stories about her work, wiggling her body at the excitement of being included. I always smile, fascinated by the Deloros’s artwork and the love she gives Zoey. During the poetry reading, I didn’t take very careful notes. I scribbled on tiny yellow and orange piece of papers with poems on them, writing on the back sides of “The Real Work,” by Wendell Berry and two copies of a poem by Gary Snyder, “Hay for Horses.” I forgot my work of being a journalist, absorbed in being a poet and a listener of poetry, marveling at the beauty of the lines and images the poets presented. In other words, I forgot to work. The Community Poets, a group of local poets and organizations that organizes poetry readings and workshops in Loveland, will hold the next seasonal reading Dec. 16 on Frosty Nights and the Pleasures of Winter, inspired by the poetry of Robert Frost, at the Loveland Museum. The poetry readings are held every season, and the workshops are held twice a year in April and August. I get lots of attention as one of my friends readies me for a walk. See my pink coat and leash! 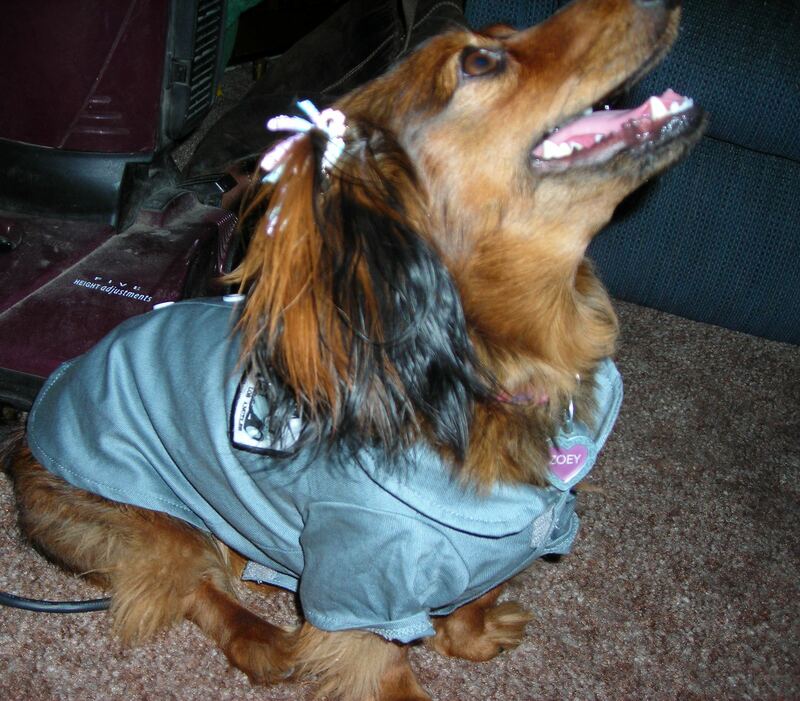 I’m cute, and I’m a princess, and I’m also a Dog Grammarian. That means I like proper grammar as much as I like proper pets. Oh … I’m supposed to talk about grammar. I hate misplaced or misused commas. This is how commas are supposed to work: they separate thoughts and ideas, such as two complete sentences separated by the words “and” or “but.” They do not replace periods. They may or may not be used before the word “and” when a series of words are listed, but that all depends. I don’t like missing periods at the end of a sentence Period. I hate it when capital letters are used when the letters should be small or vice-versa, though I’m always a capital CZ for Cute Zoey. I hate ellipses. I want to know what you’re thinking, not have to guess. I’m not a mind reader. I’m a dog. I hate misspelled words or mixed-up words like “their,” “they’re” and “there” and “lie,” “lay” and “laid.” I lie down. I’m over here, not there. I’m eating my treat. And last but not least I don’t like negative constructions. I like to be positive, or mostly. I am most certainly positive when I get treats. I am positive when I get petted. And I get extra, extra cheerful when my bowl is full of good things to eat. I’m feeling a bit lazy—could it be the dog days of summer, though it’s not even spring? For that reason, I thought I’d share my BFF Shelley and cowriter’s blog this week, or reblog her blog. But first, here’s a picture of cute me. I want my treat. I like milkbones, cheese, carrots, green beans and anything human food-related. 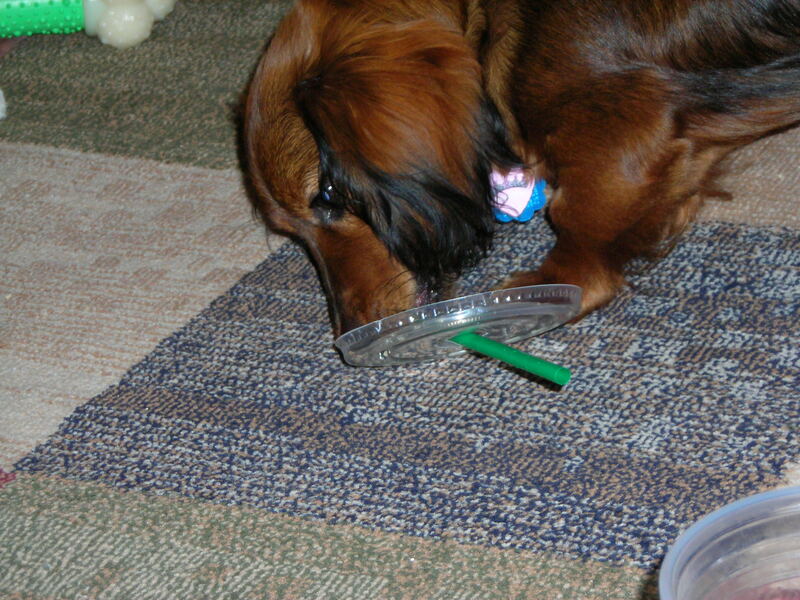 I like some of my doggie treats, too, but I prefer anything from the table. Table food. Table scraps. I deserve my treat, too. Being Cute, cute dogs, Cute Zoey! I am the product. I am the process. My BFF and co-blogger Shelley blogged this week about writer’s block and how just doing writing helps you write and get the words to flow. It’s like the process of writing helps you write. As you write, you get a product. Yep, I’m philosophical. I’m smart. And I’m cute. 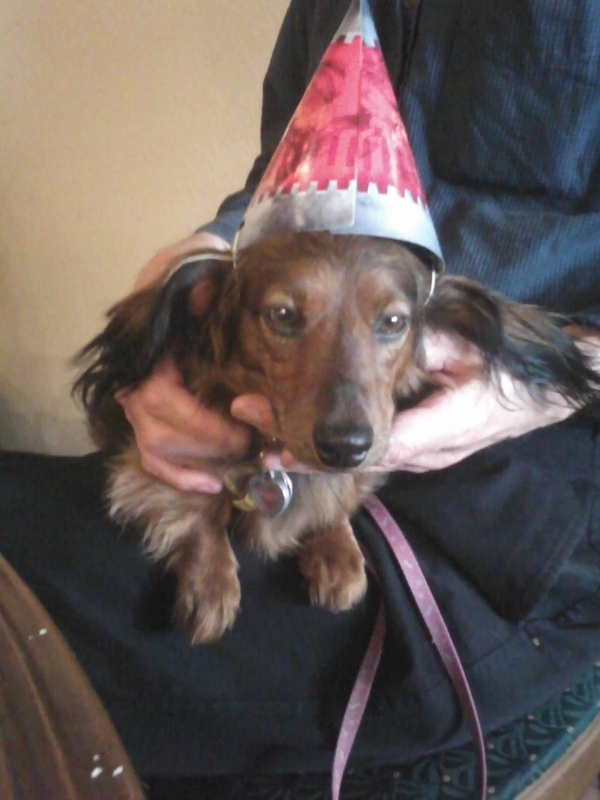 My name is Zoey, and I’m the cutest dachshund ever. While Shelley works on her writing at the coffee shop, I sit with her staring out at the sidewalk, wiggling my tail at all the passersby. Most of them stop and ask to pet me. And I eat it up, wiggling my tail so fast you just see a blur. I get told that I’m cute, I have a cute face, I’m pretty, I’m friendly, and I’m oh so nice. In fact, I consider myself the ambassador of cuteness. Check it out, me being cute and all. I’m cute when I’m sleeping. I’m cute when I’m awake. And I’m cute when I want something, like treats! I am sitting atop some newspapers. Now, I need a photo of me on top of magazines written just for dogs. Dogs (and cats, too) should have magazines geared toward dogs (and cats) who are able to read. I’m a dog. I can read. And I’m cute. People have magazines for every hobby, interest, craft and political leaning, plus celebrity gossip, news and entertainment. But dogs, what do we get? Magazines geared toward humans about training your pet, caring for your pet and doing pet-related things. The magazines aren’t meant for us and our interests. I could go on and on, but this gives the basic idea that there is something missing. We dogs need our news and entertainment not just in the forms of balls, toys and treats, but in selection of reading material. I am very good at writing blogs. Now I just need some readers! I noticed no one really reads my blog. It’s probably because I’m a dog, and dog bloggers aren’t as common as people bloggers. I don’t know what to do about it. Should I keep writing, because I like to write about the world around me (particularly smells and sounds—and I do love to bark! ), or should I focus on running around the outdoors sniffing and sorting the components of everything I smell? Should I live contextually out in the world, or textually within the text of what I create? Should I do this, this writing? I don’t know. I would like a Like or two or three to let me know that there’s meaning in what I do. An audience, someone to hear my utterances. As the main character in my own story, I am on vacation this week. Check out my BFF Shelley’s blog on character identities. 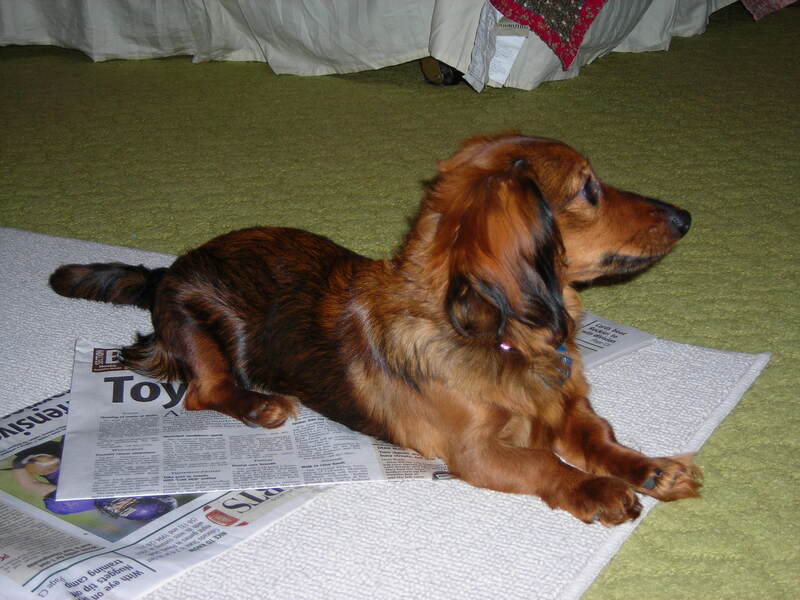 But before you do, I want to demonstrate that my identity is that of a cute, darling dachshund, so here a few photos of cute me. Don’t I look cute as I concentrate on eating a treat? 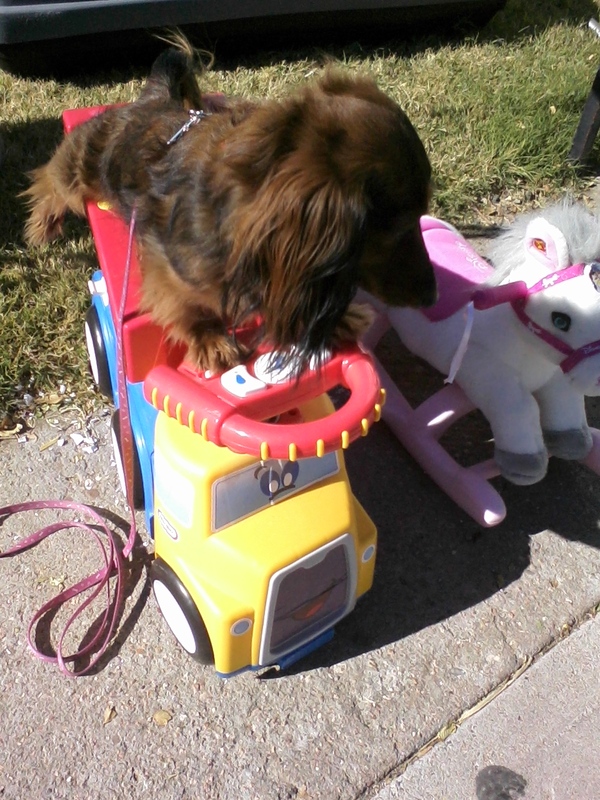 I’m cute when I’m atop toys. I love, love to play! And I’m cute when I chew on coffee cup straws. Don’t I look extra cute in my hat? Yes, I do! 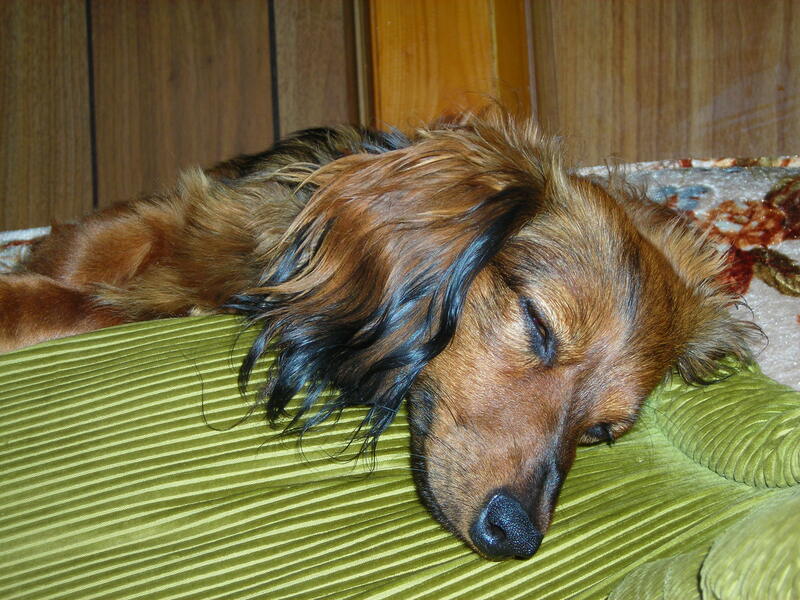 If I were to enter a contest (I entered one and lost but I think that was a mistake), I would be declared the cutest dachshund, or really the cutest dog, to have ever lived. My name is Zoey. I am six. 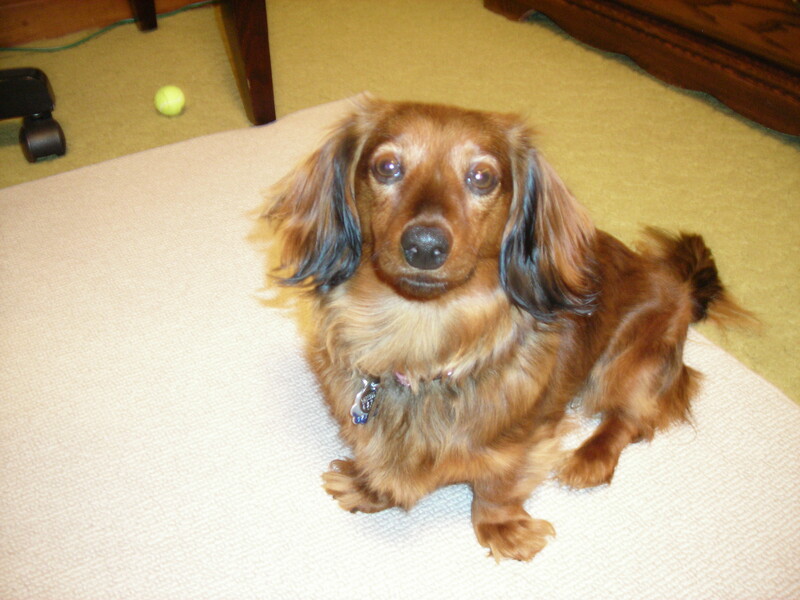 And I am a long-haired miniature dachshund who loves everybody and is loved by everybody. Well, for one I’m cute. Two, I ask for attention by wiggling my tail, looking up at the person until they see me and acknowledge my existence and cuteness factor, and once attention ensues, rolling on my side to show my belly (indicating that, yes, I want to be petted). I have big brown eyes, long black-tipped ears and a fluffy tail, making me pretty, cute and adorable all in one puppy package. I also am cute when I stand on my hind legs and cross my paws, indicating I want something. I can sit, lie down, spin or look pretty. But I won’t shake. These are some of my tricks. Nothing too fancy, but they show that I’m a good listener, a skill that’s important for being lovable and loved. In conclusion, I need to be loved, liked and told I’m cute, because I am. (See my writing partner Shelley’s blog about entering writing contests at shelleywidhalm.wordpress.com).